Okay. not the best applique for the bat. But it’s finished and I’m moving on to the next block. I want to get row 1 done before I get the packet for row 2. I only have a week to do that. I’m not going to hold my breath but I’m going to try to get as much done as possible. To do this, I’ve decided to group as much of the work as possible. That means working on all the blocks at the same time. The first thing I did was to cut all the background fabric for all the blocks. The next thing I have to do is piece them all together. I forgot that there are 5 blocks for each row so I only have all the fabric cut for the first 4 blocks. I’ll finish cutting the fabric for the 5th block tomorrow. Then I’ll work on piecing the backgrounds together. Block 3 and 5 are entirely pieced so they will be done at that time. Here’s each step laid out. using a lightbox trace all the pieces onto the corresponding fabric and on the background for block 2 and 4.
beginning with block 2 I will machine applique and see how that goes for me. 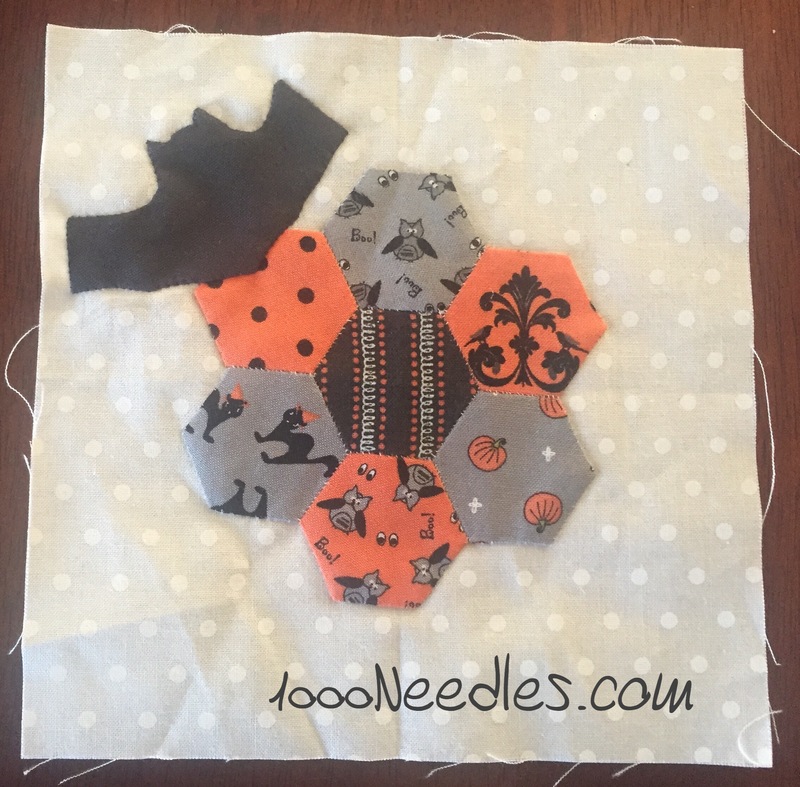 I enjoy needle turn applique but I’ve got a lot of handwork right now and I’ll save the smaller items to hand applique. I agree with you, I do not redo applique. Saying that, your applique bat looks great. No need to even think about redoing it. A very fun block. Good luck with your plan for finishing up row 1.